Cerebral vascular surgery treats vessel abnormalities in the brain and spinal cord, including arteriovenous malformations (AVMs) and aneurysms. These procedures often involve clipping the vessels feeding blood to these abnormalities, making accurate classification of blood vessel types (feeding vs. draining) important during surgery. Previous work to guide the intraoperative identification of the vessels included augmented reality (AR) using pre-operative images, injected dyes, and Doppler ultrasound, but each with their drawbacks. We propose and demonstrate a novel technique to help differentiate vessels by enhancing short video of a few seconds from the surgical microscope using motion magnification and spectral analysis, and constructing AR views that fuse the analysis results as intuitive colourmaps and surgical microscopic view. We demonstrated the proposed technique retrospectively with two real cerebrovascular surgical cases: one AVM and one aneurysm. The results showed that the proposed technique can help characterize different vessel types, which agree with the vessels types (feeding and draining the abnormality) identified by the operating surgeon. (LBP). Currently, time-consuming and laborious manual segmentations of paraspinal muscles are commonly performed on magnetic resonance imaging (MRI) axial scans. Automated image analysis algorithms can mitigate these drawbacks, but they often require individual MRIs to be aligned to a standard “reference” atlas. As such atlases are well established in automated neuroimaging analysis, we created atlases of similar nature for lumbar paraspinal muscle to allow automatic segmentation and assessments for low back pain. M. Fortin, Y. Xiao, M. Battie, and H. Rivaz, "Building unbiased population-averaged MRI atlases for image processing and assessment of lumbar paraspinal muscle morphometry," accepted at the 45th International Society for the Study of the Lumbar Spine Annual Meeting, 2018. Y. Xiao, M. Fortin, M.C. Battie, H. Rivaz, "Population-averaged MRI atlases for automated image processing and assessments of lumbar paraspinal muscles," European Spine Journal, accepted 2018. Raw ultrasound (US) signal has a very high dynamic range (HDR) and, as such, is compressed in B-mode US using a logarithmic function to fit within the dynamic range of digital displays. However, in some cases, hyper-echogenic tissue can be overexposed at high gain levels with the loss of hypo-echogenic detail at low gain levels. This can cause the loss of anatomic detail and tissue texture and frequent and inconvenient gain adjustments, potentially affecting the diagnosis. To mitigate these drawbacks, we employed tone mapping operators (TMOs) in HDR photography to create HDR US. We compared HDR US produced from three different popular TMOs (Reinhard, Drago and Durand) against conventional US using a simulated US phantom and in vivo images of patellar tendon pathologies. 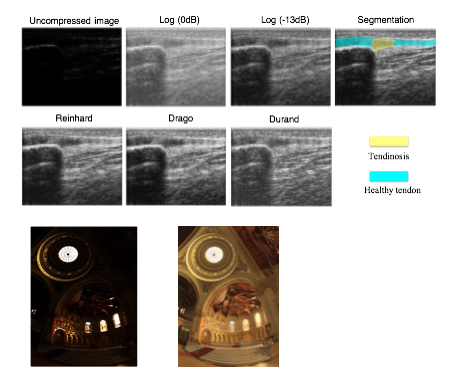 Based on visual inspection and assessments of structural fidelity, image entropy and contrast-to-noise ratio metrics, Reinhard and Drago TMOs substantially improved image detail and texture. Cerebral hyperperfusion syndrome (CHS) is a complication that can occur after carotid endarterectomy (CEA), the treatment of choice to decrease the subsequent risk of fatal or disabling stroke for patients with symptomatic severe stenosis of the carotid artery. Because of its rarity and complexity, the mechanism of the condition is still unclear, making its prevention via prediction and monitoring challenging. This is especially true during surgery, when multiple factors can induce physiological changes, including blood pressure and baroreceptor functions, which are crucial factors for post-CEA hypertension and CHS. 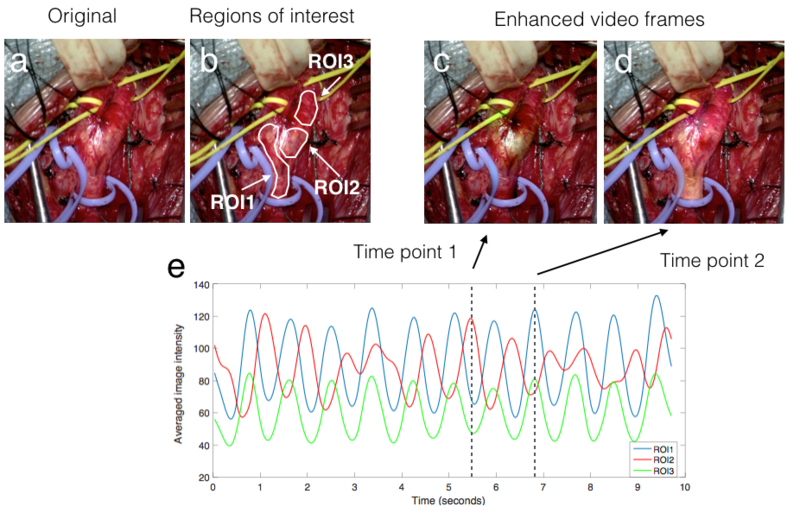 Thus, with intra-operative videos taken by surgical microscopes, we employed a new video processing technique to magnify ordinarily invisible carotid artery pulsation patterns as rhythmic color fluctuations. For those with CHS, abnormal pulsation patterns were detected at the site of the baroreceptors. The results suggested that intra-operative baroreceptor dysfunction can potentially be linked with post-operative hypertension, as well as the occurrence of CHS. Diffusion MRI is gaining growing significance in brain tumor resection thanks to its ability to reveal brain connectivity that helps design surgical plans to minimize neurological deficits. However, intra-operative tissue shift often renders the surgical plan invalid, potentially risking surgical safety and accuracy. The shift can be tracked with the joint use of intra-operative imaging (e.g., intra-operative ultrasound, or iUS) and image registration, but the technique has not been shown for brain tractography that is obtained from diffusion MRI. We employed a correlation-ratio-based nonlinear registration algorithm to account for brain shift through MRI-iUS registration, and used the displacement field to deform both the brain anatomy and tractography seen in the pre-surgical plan. We showcased the technique retrospectively with real clinical cases of low-grade brain glioma resection, and demonstrated the feasibility and necessity for updating white matter tracts intra-operatively. Stroke is the second leading cause of disability worldwide. Thrombectomy has been shown to offer fast and efficient reperfusion with high recanalization rates and thus improved patient outcomes. One of the most important indicators to identify patients amenable to thrombectomy is evidence of good collateral circulation. Currently, methods for evaluating collateral circulation are generally limited to visual inspection with potentially high inter- and intra-rater variability. In this work, we present an automatic technique to evaluate collateral circulation. This is achieved via low-rank decomposition of the target subject’s 4D CT angiography, and using principal component analysis (PCA) and support vector machines (SVMs) to automatically generate a collateral circulation score. With the proposed automatic score evaluation technique, we have achieved an overall scoring accuracy of 82.2% to identify patients with poor, intermediate, and good/normal collateral circulation. 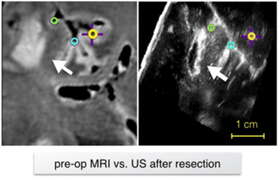 The repository includes pre-operative MR and intra-operative US images from 23 patients who have received low-grade gliomas resection surgeries (no follow-up re-operations) at St. Olav’s University Hospital. Homologous landmarks are provided between MRI and US, as well as between US volumes during different surgical stages. The database provides a common ground to validate different image registration techniques for improving the surgical treatment of brain cancer. Brain atlases are highly instrumental in image-based analysis and surgical treatment for Parkinson's disease. The repository presents a collection of multi-contrast MRI templates constructed from 25 Parkinson’s disease patients, along with manually segmented subcortical structures and a co-registered histology-based atlas of 123 structures. Group-wise unbiased registration driven by a novel T1-T2* fusion MRI contrast, which visualizes both cortical and subcortical structures was used to obtain the deformation fields to generate the averaged atlases. Ultrasound calibration is often required in image-guided procedures to establish the spatial transformation (i.e., calibration matrix) between the 2D ultrasound image and the motion trackers attached on the ultrasound probe. I proposed a novel method that computes the calibration matrix by automatically matching a series of tracked 2D US scans of a phantom made of Lego bricks to its digitized model. The method overcame the complexity and heavy dependency on user intervention in most state-of-the-art methods while providing similar results. The use of Lego bricks offers the user more freedom to adapt the method for their specific needs. TCUS can image the brain through acoustic windows of the human skull by operating at low frequencies (1~5MHz). It is commonly used in diagnosing and monitoring neurovascular diseases (e.g., stroke). However, the examination of TCUS images can be challenging because of lower image quality and difficult interpretation due to oblique 2D imaging angles. I have built an interactive user interface that employs a population-averaged brain atlas as a reference to guide TCUS acquisition in real time. The system provides both 2D and 3D graphic rendering for intuitive TCUS examination. Y. Xiao, I.J. Gerard, V. Fonov, D. De Nigris, C. Therrien, B. Aubert-Broche, S. Drouin, A. Kochanowska, D. Tampieri, and D. Louis Collins, "Atlas-guided transcranial Doppler ultrasound examination with a neuro-surgical navigation system: case study", 4th MICCAI workshop on Clinical Image-based Procedures: Translational Research in Medical Imaging (CLIP), LNCS 9401, pp. 19-27, 2016, DOI: 10.1007/978-3-319-31808-0 3. Y. Xiao, S. Drouin, I.J. Gerard, V. Fonov, B. Aubert-Broche, Y. Ma, M. Kersten-Oertel, D. Tampieri, and D. Louis Collins, "An augmented-reality system prototype for guiding transcranial Doppler ultrasound examination", Multimedia Tools and Applications, accepted, 2018. Parkinson's disease (PD) is a neurodegenerative disorder that impairs the motor functions. Both surgical treatment and study of PD require delineation of basal ganglia nuclei morphology. While many automatic volumetric segmentation methods have been proposed for the lentiform nucleus, few have attempted to identify the key brainstem substructures including the subthalamic nucleus (STN), substantia nigra (SN), and red nucleus (RN) due to their small size and poor contrast in conventional T1W MRI. A dual-contrast patch-based label fusion method was developed to segment the SN, STN, and RN using multivariate cross-correlation. Two different MRI contrasts (T2*w and phase) are produced from a multi-contrast multi-echo FLASH MRI sequence, enabling visualization of these nuclei. 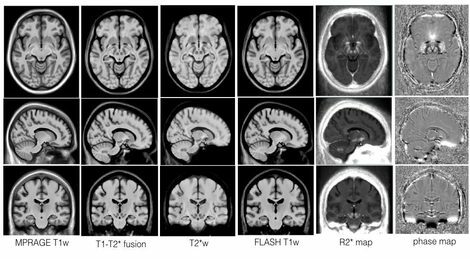 T1-T2* fusion MRI was used to resolve the issue of poor nuclei (i.e., the STN, SN, and RN) contrast on T1w MRI, and to mitigate susceptibility artifacts that may hinder accurate nonlinear registration on T2*w MRI. The subthalamic nucleus (STN) is one of the most common stimulation targets for treating Parkinson's disease using deep brain stimulation (DBS). This procedure requires precise placement of the stimulating electrode. 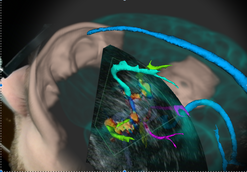 Common practice of DBS implantation utilizes microelectrode recording to locate the sites with the correct electrical response after an initial location estimate based on a universal human brain atlas that is linearly scaled to the patient's anatomy as seen on the preoperative images. However, this often results in prolonged surgical time and possible surgical complications since the small-sized STN is difficult to visualize on conventional magnetic resonance (MR) images and its intersubject variability is not sufficiently considered in the atlas customization. This paper proposes a multicontrast, multiecho MR imaging (MRI) method that directly delineates the STN and other basal ganglia structures through five co-registered image contrasts (T1-weighted navigation image, R2* map, susceptibility-weighted imaging (phase, magnitude and fusion image)) obtained within a clinically acceptable time. The image protocol was optimized through both simulation and in vivo experiments to obtain the best image quality. Taking advantage of the multiple echoes and high readout bandwidths, no interimage registration is required since all images are produced in one acquisition, and image distortion and chemical shift are reduced. This MRI protocol is expected to mitigate some of the shortcomings of the state-of-the-art DBS implantation methods. The success of DBS for treating PD relies on the precise electrode placement in the lentil-sized subthalamic nucleus (STN) while avoiding adjacent structures, such as the substantia nigra (SN) and red nucleus (RN). Conventional DBS planning employs standard atlas coordinates to target these structures because they are almost invisible on traditional T1w MRI images. Working with University of Rennes 1, I investigated the anatomical variability of these midbrain nuclei (i.e., STN, RN and SN) by segmenting the structures from 3T high-resolution T2w MRIs that directly visualize them, and employing implicit statistical shape modeling to rank and visualize the variability, and to explore the variability’s link to disease severity. My findings have shown that direct nuclei targeting with specialized MR images is a better choice than only using atlas coordinates in DBS planning. Y. Xiao, P. Jannin, T. D'Albis, N. Guizard, C. Haegelen, F. Lalys, M. Vérin and D. Louis Collins, “Investigation of morphometric variability of subthalamic nucleus, red nucleus, and substantia nigra in advanced Parkinson's disease patients using automatic segmentation and PCA-based analysis,” Human Brain Mapping, vol.35(9), pp. 4330-4344, 2014.